Hey Guys, I’m back with another easy Guide in which i will tell you how can you flash custom Recovery or Boot / Kernel .img Image Files with the help of Flashify App. You might be having some issues in installing any zip files or boot.img files which is available for Nexus devices & other custom kernel along with other devices. While flashing those files you badly need a Laptop / Computer for flashing those images zip files. Flashify zip files and Recovery is really difficult for us, because in that time we don’t have a way to flash zip from computer instead of mobile. Previously we were shared- How to Change Boot Animation of Android. So switching on Laptop or desktop again & again. In today’s world i think too many people is flashing custom roms and custom recovery in their mobile phone.You know Why? Only Just because no one loves stock ROM and everyone interested in Custom Roms where they can easily install those files without using recovery in our Android device using flashify. this app developer named Christian Gollner came up with an application named is flashify from which you can easily install custom recovery and boot images easily. You can also – How to Flash Custom Rom in Android. Flashify is a simple tool by which you can install custom recovery directly without looking in Google and you don’t require any desktop to install it automatically looks for the custom recovery of your model and if it is available then it flashed it after asking you, you can also say flash custom recovery without pc using flashify from mobile. You also Take backup of your ROMs & custom Recovery Using flashify it is very good features of it. Nowaday there are many methods of rooting your mobile phone by one click you can search on google. Also have a look on – Use Gravity Box for Customize your Android Phone. By using this simple method you can also get an updates in your device and you can even also flash files in your device. And the one more this thing which is very best that flashify app apk application is having simple and easy interface so that you can use this flasher app without any issues. 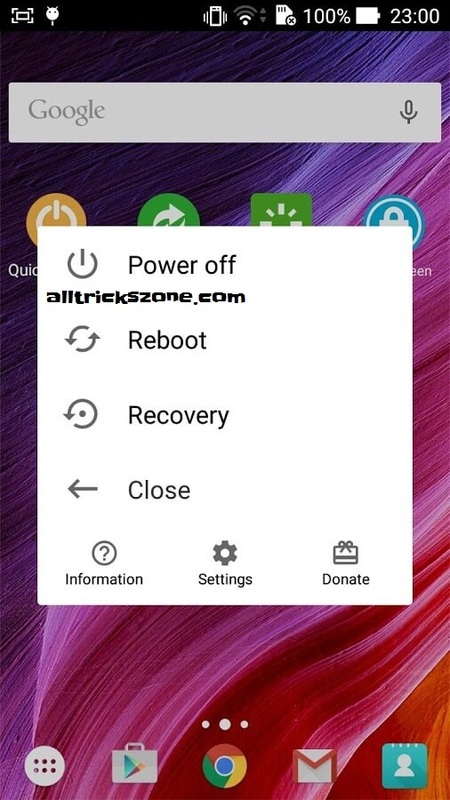 It also have a features of directly reboot your android device into bootloader and boot up into recovery in running time because, Most of the times we have to press 3 Buttons to start our recovery and with application all the works of flashing has become easy for any users of mobile phone which are familiar with tweaks either not. Also Read – Best Apps for Rooted Android Device. Keep track on your Files which files you have flashed recently in your device. Note: Sometimes this application Misbehave so try this application at your own risk. From here start the main part of article below is the list of some requirements, by which you need for use flashify app for flashing a custom recovery / ROM in your Device So let’s have a look on it now from below. So Download the flash files and keep / placed that files in your SD Card or your internal storage and don’t extract the .zip files anywhere. And a Rooted Android Phone where you want to flash the file. Now Simply Open the flashify application and This app will ask for root permission, then assign the application for root access by Grant. After that in right side of this app you will see an option named of Backup / Restore. 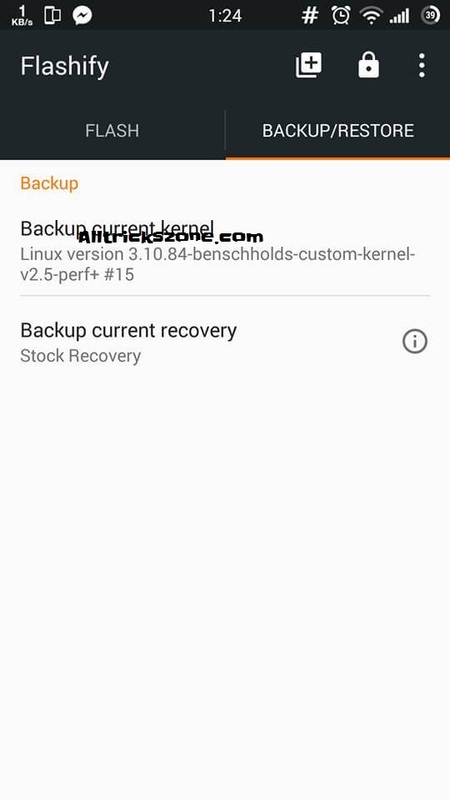 Go there and Backup your Stock Kernel and Recovery file for future if you want to roll backup to original recovery or kernel. Then, click on ZIP Files and click to Choose Files If the kernel or recovery is in flashable zip file. Or you can also Select the Boot Image file for flash. if you have img file of kernel. Now Select Recovery image option if you have img file of custom recovery file. Then simply Choose the file from your SD card which we have downloaded and placed in our mobile phone in Memory card or Internal storage space. Click to Recovery and choose your favorite recovery and install it in your device. After Install Above app from play store in your Device, Simply Open this app and grant root permission on this app. After that, you will see some simple option in this app, Simply Click on Recovery Option and you are done see below screenshot. Now your android device will boot into recovery mode, and you can check new recovery mode in your device which you have flashed earlier. use that backup any times you want to use it. and with the help of Flashify Apk you can install custom recoveries such as CWM stand for Clock work Mode, Philz, Team Win Recovery Project which is also know as TWRP. Nowaday TWRP is been used by so many peoples just because it’s more advanced great features and personally i’m also using it. I like TWRP recovery also because of it’s mount option and we can also mount our OTG Cable directly with this application so no need to reboot your device again and again. also have a look on – 6 Useful Android Tips & tricks Which you should know. because this was some of the best Quick look of flashify app. That’s it guys this was the easy way by which you can easily install zip files in your android device and flash any files like custom roms in your smartphone device and no need of any custom recovery in you device but while flashing keep in mind that you install a correct file or else it may be brick your your mobile phone and most important is backup of you android device which i have already mentioned above. also checkout – 3 Best WiFi Hacking Apps for access internet of your any people. While flashing any files in your android device your should keep in mind that you have properly took the backup of your device. well thanks for visiting stay connected with us for more cool stuffs like this.